UPDATED! I have purchased another vegan holster, from Bladetech and included it at the end. I’ll save the whole “Wait…you’re a vegan and you have guns! ?” discussion for another day. Yes, yes I own guns and enjoy self-defense and target shooting. Moving on. One of the hardest things to find for me, is a vegan concealed carry holster. Most brands, made by companies like Galco and others are made mostly with leather and polymer. Fortunately, when I recently purchased my Springfield XDS .45, the store had an ample supply of vegan holsters made by Blackhawk. 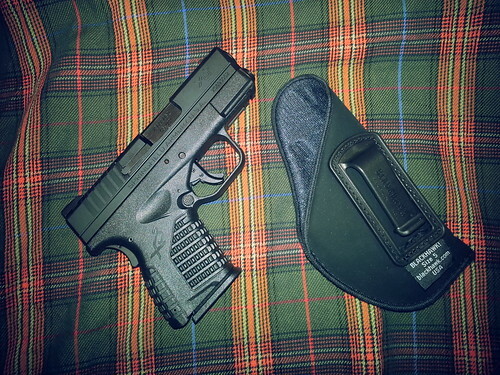 My Springfield Armory XDS chambered in .45 in the Blackhawk size 5 holster. It is important to note that these holsters are not marketed (for obvious reasons) as a vegan holster. They are basically an inexpensive option for people that can’t afford (financially or morally, I guess) the leather versions. I’ll take it! This puppy was $12.00 and works like a charm. It’s like the Payless shoes for vegan gun owners (vegans will get the joke)! The holster material is already forming to the shape of the pistol in only 2 days. The nice part about their website is that they also organize the holsters by material. So you can quickly identify which are vegan and which are not. The nylon options are here. My only complaint is the tapered section (as you see in the image) leaves the grooves on the rear of the slide exposed. When seated, this presses those metal grooves into your back which is not the most comfortable. Eventually this may affect the gun’s finish, but we’ll see. For a $12.00, non-leather holster you cannot go wrong with this option! In December, 2015 I was strolling the aisles of my local cabelas, and looked at the plastic CCW holsters they offered. I found this option for the XDS, priced at $23. Unlike the Blackhawk above, I wanted something that offered more positive locking of the pistol. 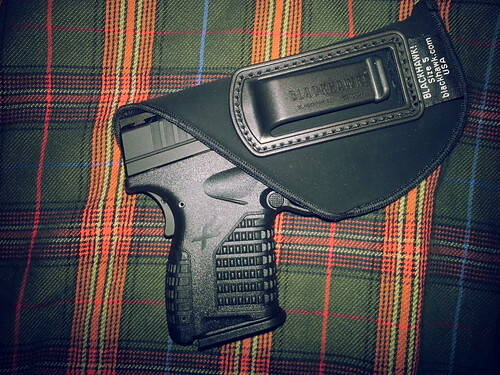 The holster from Bladetech was inexpensive, solid plastic, and has a positive “click” when the gun is fully seated. The belt clip also has a much better “barb” that provides more secure carry in the belt. I have not spent a ton of time with the holster, but the past few days I feel it is comfortable and easy to carry. I added a beautiful Sig Sauer P320 to my arsenal and added a Streamlight TLR-1s tactical light to it. This is a full frame pistol, so I gave up on CC. I added a kydex Multicam holster for it, which accommodates the light. Holster is from TR Holsters. It’s an OWB configuration and so far, so good. Previous PostTrail Report: Steelbender [Utah]Next PostWhat are your Vegan Sins? I can honestly say I’ve never seen a post like this on a vegan blog. Thanks for keeping it interesting! You are very welcome lucyfalls! Not all vegans are the same, so I certainly hope to offer some unique content. Thanks for the follow too! I’m considering getting my first gun soon…still making up my mind about it… but seeking a vegan holster hadn’t even crossed my mind, thanks for the heads up and this will be helpful if I do decide to go through with it! Jl, not sure what your experience with guns is, but you can always reach out to me with any questions on them, or the CCL process. offroadvegan@gmail.com. I am a new gun owner, having ordered a black finished, stainless 1911. Have you found a vegan gun oil you are pleased with? I too, will probably end up with a Blackhawk holster. Sounds like a beaut, Dorothy! I bought a Remington kit that came with the oils. I never thought to see if they are vegan, but I assume they are all synthetic. Keep us posted on your first gun experience. The 1911 is an AMAZING weapon! Pingback: Vegan Banana Cream Pie Oatmeal for Breakfast - Make It Like a Man! I know this is an old post, but I’ve been carrying my XDS9 in an NSR tactical AIWB holster, secured by two soft loops. It’s a little higher end, I think I paid 80 bucks for it, but, it’s all vegan, and very, very comfortable. The soft loops are a little bit of a hassle in comparison to the clip variety holsters, but it’s worth the extra 5 seconds to put it on. Your blog is awesome! I never thought in a million years I’d see another vegan CCW Jeep dude. It’s too good to be true. Hey Glen! Thanks for your kind words on the blog! And it is always awesome to find other vegans that do not fit the “stereotype.” I will check out the holster you mentioned. Still have not found the “perfect” fit. Been looking at Alien Gear and G code. Will checkout the NSR!